Soooooo...today, I'm going to tell you about the great saga of "snicked." This friendly debate has raged for years now. Years. So, we decided to post on our social media sites and ask people if they knew this word. We wagered that if it was a word, I'd put it in one of my novels (cringe), and if it wasn't a word, he'd remove it from his. Most people said they'd never heard of it. One person said it might be some skunk-like creature in some remote part of the world. After months of open discussion, Ellie aka: Kat Hawthrone stepped in (she's supposed to be my friend and co-worker, but she turned against me!). At BookFish, she's our line editor and wicked smart with words. 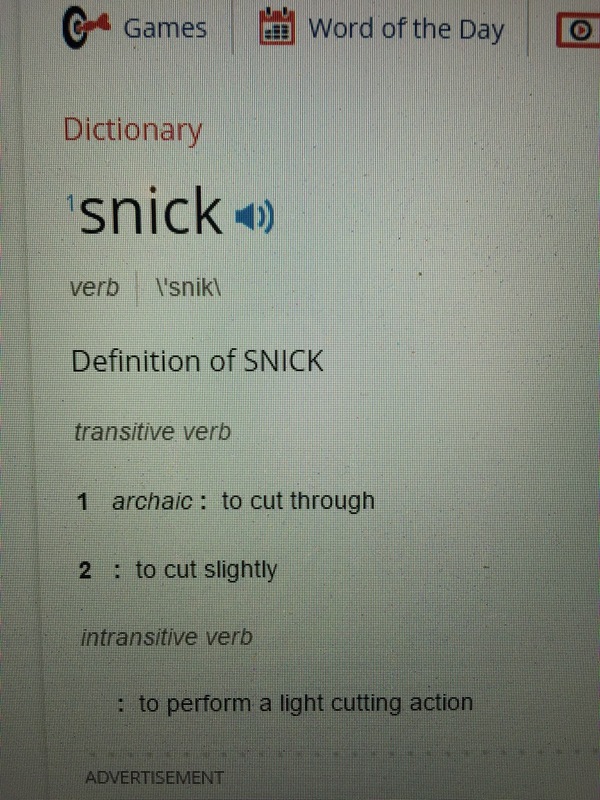 So, she found in some ancient text that "snick" is a real, albeit archaic, word. I must inform you that in Deek's novel, it's still not used to match its ancient definition (no, I'm not bitter). 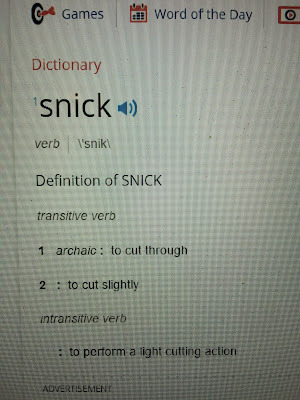 The word "snick" means to "to cut through" or "to perform a cutting action." Deek uses it to mean the sound of a door clicking shut. But since I lost fair and square, I agreed to put the word "snicked," used to mean "sound of a door closing," in my upcoming book The Fulfillment. And YOU will get to reap the benefit! When The Fulfillment comes out, Deek and I will run a Rafflecopter giveaway (starting on Oct. 15 and ending on our 1 year wedding anniversary, Nov. 7). You can enter to win signed copies of The Prophecy, The Outlanders, and The Fulfillment as well as a signed copy of Deek's book, 122 Rules, when it releases early next year from Pandamoon Publishing. If you've already purchased the books, they'd make great (FREE) Christmas presents for that reader in your life! All you have to do to win is enter the page number on which you find the dastardly word "snicked" in The Fulfillment. You can win signed copies of all THREE books! And a signed copy of 122 Rules when it releases in early 2016! Here is the Rafflecopter link (don't worry, Deek and I will post it again). It will activate on October 15! 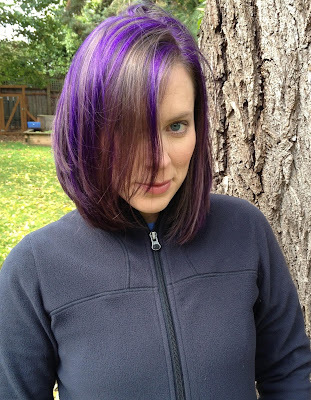 In other random news, I will be dying my hair purple again for the release. Instead of weaving the blonde in as I did last time, I'm going to leave it dark. Here's what it's likely to look like. Good luck in the giveaway! My loss is your gain! Nicole! Nooooooooo! You're supposed to be Team Erin. ;) LOL! Wow, there it is. Proof in black and white. Le sigh.